- Chicken & Shrimp - A crispy tostada shell filled with lettuce, rice, pinto beans, pico de gallo, cheese, sour cream, sliced avocado, flame-grilled chicken breast, and shrimp. Creamy cilantro dressing comes on the side. - Double Chicken - A double portion of flame-grilled chicken breast, sliced avocado, pinto beans, sour cream, rice, cheese, and pico de gallo on a bed of lettuce in a crispy tostada shell. Served with creamy cilantro dressing on the side. 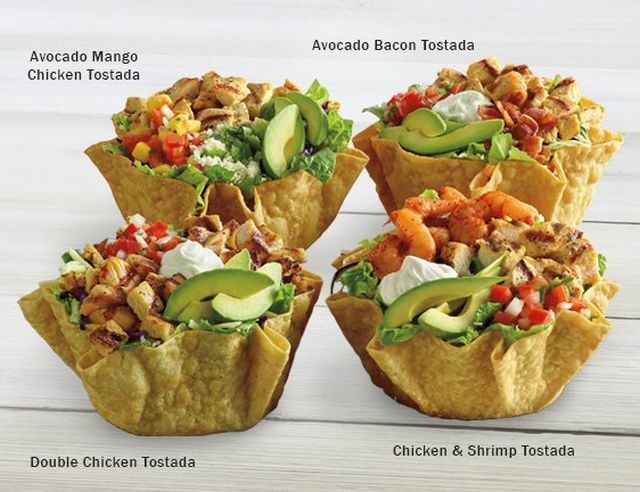 - Avocado Bacon - Flame-grilled chicken breast, sliced avocado, bacon, pinto beans, sour cream, rice, cheese, and pico de gallo over lettuce in a crispy tostada shell. Creamy cilantro dressing is included on the side. - Avocado Mango Chicken - A crispy tostada shell filled with lettuce and topped with flame-grill chicken breast, sliced avocado, mango salsa, pinto beans, rice, cotija cheese, and cilantro with a side of creamy cilantro dressing.